The Anadarko Indian Education Program is a comprehensive program utilizing targeted intervention, cultural perpetuation, community involvement, and student development projects to meet the unique educational needs of American Indian students. We provide educational intervention for targeted students through program objectives developed with Parent Committee input and Federal funding guidelines. Program offices and staff are located in each building and serve as the site points for any issue from tutoring to school supplies. Students must be enrolled with the necessary documents on file in order to receive supplies and other program services. The Title VI Enrollment Form (506) can be downloaded from the Forms page and can be either brought to our main office or to your child's school. JOM Enrollment requires a copy of your child's CDIB showing they are enrolled in the tribe. Eligible students must be a member of an American Indian Tribe or be at least a one-fourth (1/4) blood descendent of a Federally-Recognized American Indian Tribal member. (PL 99-228). Forms can also be faxed 405-247-6501 For more information contact us at 405-247-2288. 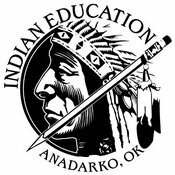 In compliance with updated ESSA guidelines for Parent and Tribal Input in connection with the Title VII Impact Aid Federal Program, the 2018-2019 Anadarko Indian Education Program Parent Advisory Committee Meeting Notices have been posted on our website. This posting is in alignment with the recently accepted Indian Policies and Procedures adopted by the APS Board of Education at the December board meeting. For more information contact us at 405-247-2288. The May Indian Education Committee Meeting will be on Monday, May 13th in the Indian Education Center at 5:00 pm. The meeting will cover program reports and upcoming activities. All parents are welcome to attend. For more information contact us at 405-247-2288.